Daniel records the history of King Nebuchadnezzar who was so enamored with himself and his accomplishments that he wanted to be worshipped. A frightening, prophetic dream interpreted by Daniel brought fear to the king’s heart and later became reality. As Nebuchadnezzar was praising himself and his achievements, a voice came from heaven declaring that he would enter into a period of insanity. He’d be driven from his people and would eat grass among cattle. 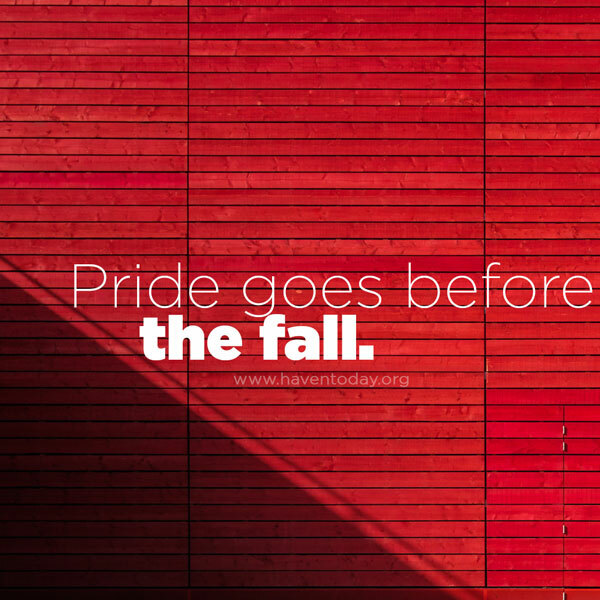 Proverbs 16:18 came alive: “Pride goes before destruction, a haughty spirit before a fall.” In time, Nebuchadnezzar’s sanity was restored, and his pride was gone. Not one of us is outside the reaches of pride. We struggle with it daily, sometimes walking dangerously close to utter breakdown as with Nebuchadnezzar. We need Paul’s warnings against it and Peter’s reminders that God opposes the proud but gives grace to the humble. Jesus condemned the teachers of the law for their pride. Then He, being in very nature God, humbled Himself and became obedient to death for our sakes. The Lord will humble the proud. When you’re tempted to walk in haughtiness and pride, choose to walk in humility instead.